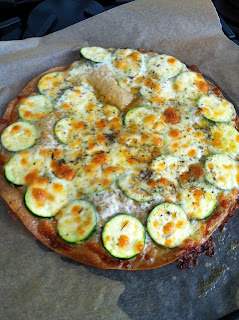 zucchini flatbread | what is clara eating today? put tortilla on pizza pan lined with parchment paper (for easy cleaning). spread 1T olive oil all over the tortilla. bake at 320 for 6 minutes. take out of oven and add zucchini slices. drizzle 1T olive oil on top of zucchinis. spread mozzarella cheese. sprinkle herb. add olives. bake at 320 for 4-6 minutes.